PRINT & DIGITAL CONVENTION presents solutions for omnichannel marketing. The exhibition and accompanying lecture and workshop programme combine marketing, concept and design with marketing realization for digital and print. The Convention aims to inform and educate visitors. How does omnichannel publishing work? What innovative technologies and solutions are available for marketing realisation – both print and digital? In various lectures and the accompanying exhibition, speakers and exhibitors show their vision of the future of digital transformation in marketing. PRINT & DIGITAL CONVENTION sets the course for forward-looking communication along a wide variety of media channels. It integrates the possibilities of print in all its facets with the opportunities opened up by the digital transformation. The focus is not on individual technologies or solutions, but rather on the close interplay of all elements within an effective strategy, which can also be applied to your company with minor adjustments. PRINT is understood here as one of several communication channels that has found a new role in the communication mix and is consistently developed along the requirements of Print Finishing, Digital Printing, Industry 4.0, Digital Transformation and Printed Electronics. DIGITAL refers to new strategies and software solutions for cross-media communication that drive companies – be it through the simplification of processes, improvement of response and reach, AI-supported evaluation of Big Data or through faster response times, made possible by central and media-neutral data storage. All of this takes place within the framework of our established and proven CONVENTION concept, which, as a platform for experts from individual sectors, facilitates unique interaction between players. At the event, we bring together the interests of supply and demand, allowing direct exchange of experiences in a pleasant and inspiring atmosphere that not only enables networking but actively encourages it. By Theme Worlds with sophisticated applications that were developed through the close cooperation of various exhibitors. Through a wide range of exciting lectures on various topics by speakers who are available for in-depth discussions. And last but not least, by high-calibre and interested professional visitors from the industry, which are interested in innovative and effective solutions and new strategic approaches and actively contribute to the discourse with subject-specific questions. 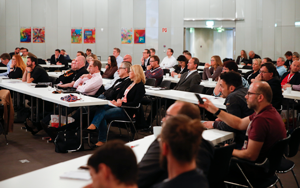 PRINT & DIGITAL CONVENTION is more than a just a conference exhibition – it is a real experience. It makes complex technical solutions tangible by showing them in practical applications; not as isolated solutions, but in everyday application scenarios with a view to those who use advertising and communication strategies. PRINT & DIGITAL CONVENTION is a central meeting place for all important decision-makers from industry, retailers and brand owners. Here, industry leaders, marketing and media professionals, and technology and innovation drivers come together to define the future together. A unique hot spot for businesses to experience innovative forward-looking developments and trends in digital marketing, technology and business. Experience real-life marketing realisation stories. Receive valuable strategic suggestions, information and recommendations through the exhibition and lecture programme. Whether product or brand communication, omnichannel, technologies for print and digital, business or future – the range of topics is diverse and offers endless possibilities to discover trends and receive inspiration. The Convention is a meeting point to discuss and network, also with other decision-makers, and to engage in dialogue, education and inspiration. Experience digital trends and future business potential and meet all major service providers and partners.